Shah Rukh Khan, Salman Khan, Hrithik Roshan, Katrina Kaif add stardust to Poorna Patel's Reception in Mumbai! Politician Praful Patel's daughter Poorna Patel tied the knot with industrialist Namit Soni over the weekend and it sure was an affair to remember. 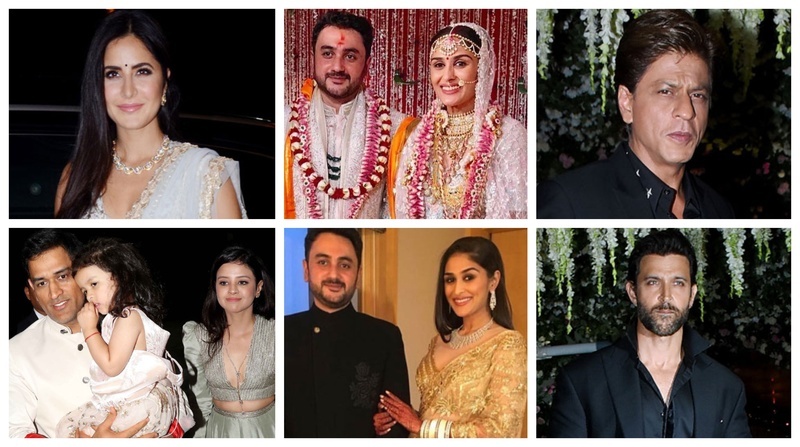 Her mehendi, sangeet and wedding and reception were attended by the biggest names from the B-town making it one big starry celebrity wedding! For her Sangeet night Poorna chose to wear a custom made Manish Malhotra lehenga with 3-D threadwork and encrusted crystals looking completely sparkly. I totally love the pop-of-colour with her emerald green necklace. Her off white Manish Malhotra wedding lehenga which took more than three months in making had soft pink flowers embroidered with light silver zardosi embroidery of encrusted leaves and flowers. It also features an enchanted garden celebrating romance with soft ethereal colours enhanced with phiroze blue. It’s trail has the Names of Poorna and Namit embroidered and beautiful shlokas and sayings too making it completely personalised and timeless. Poorna Patel and Namit Soni gave us major #CoupleGoals in custom-made Manish Malhotra's ensembles for their wedding reception. Poorna looked stunning in her glittery golden saree, which she accessorized with a set of diamond danglers and necklace. Namit on the other hand chose to wear a bandhgala for the special occasion. Shah Rukh Khan arrived at the reception looking dapper in a 3-piece black suit. Salman Khan looked his usual stunning self in a blue blazer paired with a black shirt. I am majorly crushing over Katrina Kaif's powder blue lehenga, which she accessorized with a pair of studs and matching neck piece. P.S. that bindi complemented Katrina's traditional look so well. Hritik Roshan looked his handsome self in his all-black attire. Sonakshi Sinha looked ravishing in her lime green Abu Jani Sandeep Khosla ensemble. Newly-weds Neha Dhupia and Angad Bedi also complimented each other in a navy blue lehenga and a black achkan from Shantanu and Nikhil. The designer looked stunning in an all-black ensemble. P.S I love the statement shoes complementing his blazer. Some major couple dressing goals here. Sophie Chaudhary looked stunning in that lace saree paired with an off-the-shoulder blouse. Urvashi Rautela looked gorgeous in that pink Abu Jani Sandeep Khosla attire. Loving that beige saree with white intricate embroidery on it. Cricketer Mahendra Singh Dhoni arrived with wife Sakshi and their little one Ziva. While MS Dhoni and Ziva were colour coordinated, Sakshi chose a low-cut grey Payal Singhal lehenga for the reception. Zaheer looked dapper in a plaid blue blazer paired with plain blue pants and blue shirt. With our list coming to an end, here’s wishing Poorna and Namit a lifetime of togetherness.